The name Uzume Taiko derives from the Japanese word for "Big Drum" and from the Goddess of laughter, Ame No UzumeNo Mikoto -- The Heavenly Alarming Female who, according to legend, began Taiko drumming. Taiko has held a centuries-old place in Japanese culture and it is from the power and athleticism of traditional drumming techniques that Uzume Taiko draws its inspiration. Using a diverse collection of percussive and melodic instruments as well as taiko drums, Uzume has developed a dynamic fusion of old and new styles of drumming -- bringing a vibrant conemporary sensibility to an ancient art. With the choreographed physicality of martial arts, the heart-stopping pulse of the O-Daiko and the rhythmic sensitivity of a jazz ensemble, the drummers of Uzume Taiko create an exhilarating sensual experience. Noteable Entertainment & Events is a Vancouver based booking agency, party rental, entertainment services and event production company. 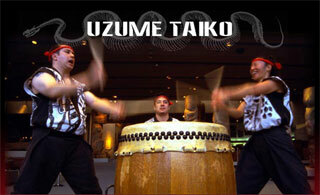 If you are interested in booking Uzume Taiko please contact us.